While grubbing out a firmly rooted Gorse plant on our Headlands, I was thinking about some of the more ironic facts of human life. Gorse, aka furze and Ulex europaeus, would not be here if not for another alien life form, namely: us. Local legend says that a Scots dairy farmer, having achieved some prosperity in Caspar, traveled to the Auld Country and saw the miraculous hedgerows of evergreen thorny bushes with bright yellow flowers even in the dead of winter. On stony Scottish soil, sheep and cattle keep Gorse confined to hedgerows between fields. Our early Casparado clipped some starts, wrapped them in a napkin, tucked them into his luggage, and brought them home to plant in place of those pesky barbed wire fences that were always falling down. What could possibly go wrong? When his little gorse clippings encountered the richer soil and balmier Caspar climate, they took off. No herd of cattle or sheep had a chance of confining Gorse to the edges of our fertile, clement fields. Over the years, many methods of controlling gorse have been tried, and most have failed. The biological control often seen here, the Gorse Spider Mite Tetranychus lintearius, another European native and one of Gorse's ten known predators, is smart enough not to completely eliminate its only food source. Gorse itself is unbelievably hardy, enthusiastically regenerating itself from seed, branch, or root. Heavy equipment used in abatement efforts must be carefully steam cleaned after use, or seeds and twigs on it will start an infestation wherever the equipment next works (hence the infestation at Caspar Dump.) Cutting Gorse's tops merely encourages stronger root systems on the resurgent plants. Branches, stems, and roots contain 30% or more of flammable oil, and Gorse thrives on fire, shooting its thousands of fire-resistant seeds 30 feet; these seeds have a half life of 30 years, meaning that at the end of three decades, half of the seeds are still good to grow. Gorse is one of Caspar's nightmares. In 1987, a fire started in a Gorse patch on the north side of town. Because the roots are as oily as the stems, Gorse burns underground. The fire was stopped before it took houses ... that time. With ongoing drought and the Valley Fire on everyone's mind, Gorse abatement resurfaces as one of Caspar's hottest topics. In 1999, the Caspar Community identified Gorse and Eucalyptus as two of our most dangerous neighbors. Since then, much of the Eucalyptus has been removed, and many of the worst Gorse patches have been attacked, with some success. The fact remains that one Gorse bush is too many. While newcomers admire its cheery yellow blossoms during the darkest days of February, we know that its forbidding spikes and stubborn persistence are best confined to its native Western Europe. The Mendocino Fire Safe Council, whose mission is “to help the citizens of Mendocino County survive and thrive in a fire-prone environment” has a Caspar contingent who help property owners get funding to attack their Gorse infestations. The abatement conundrum with a plant as stubborn as Gorse is that once planted, it takes almost super-human persistence to wipe it out. Chop its top, and it comes back with strengthened roots. Introduce Spider Mites, and up to half the Gorse crop will be set back a year or two at most. Mow it for a few years, and your reward is a “lawn” of ground-hugging Gorse. Burn it, and it spews seeds that resprout in a year. Uproot it, and inevitably it regrows from little bits of root that break off and remain in the soil. Stuart Tregoning and Ralph Eagle developed a technique involving mowing, ripping the soil up to expose the roots, and then following up annually without fail by pulling up the shallow rooted sprouts ...but skip a year, and you get to start all over again. State Parks has invested a great deal of money in first-year abatement, but without perpetual follow-up, the Gorse regrows. Caspar Community has had the greatest success of any (although the maintenance effort continues) on our Headlands, where uprooting and stacking the plants with the roots exposed has decreased the Gorse coverage by half. Gorse isn't just a local plague. Other farmers imported it unknowingly to Australia, Hawaii, Sri Lanka, Costa Rica, Scandinavia, even to some subarctic islands. 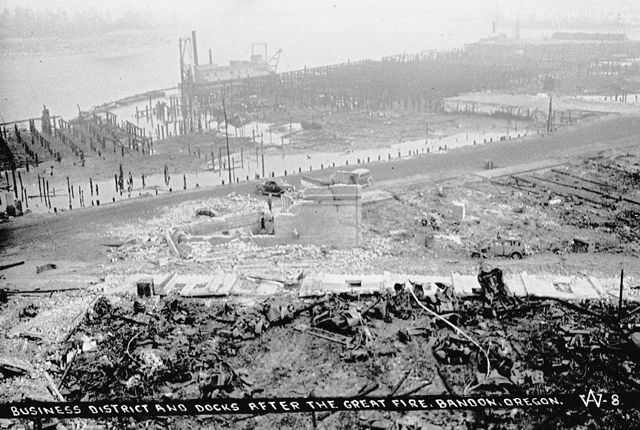 Gorse was the principal cause of a fire that destroyed Bandon, Oregon, in 1936. What's wanted, of course, is a silver bullet, something as simple and sure to end gorse as thrusting a gorse clipping into the ground is sure to start an infestation. The good news and bad news rolled up in one is that such a silver bullet exists ...and so far, Casparados choose not to use it: Cut the gorse stem at ground level and immediately, carefully, paint it with the herbicide glyphosate, and that Gorse plant is done. A crew with good loppers, a chain saw, a pint of chemical, and a carefully wielded paint brush can finish off an acre of Gorse in a day. True, all the cuttings need to be dealt with, and the existing seed stock will be viable for a few decades; annual grubbing up of the sprouts will be absolutely required. But most of the heavy work will be done once ... and the followup can be carried on by livestock as picky as horses, who appear to love the tender little Gorse seedlings. 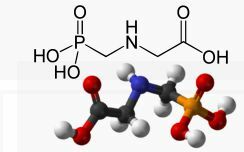 Glyphosate molecules are structurally similar to the amino acid glycine, and bind to the active sites on the EPSP synthase enzyme – the engine that produces the proteins plants need to grow – where glycine is meant to fit. With all the glycine sites plugged by glyphosate, a plant cannot produce the essential proteins (phenylalanine, tyrosine, and tryptophan, among others) it requires to grow or heal. In the constant ferment that characterizes life in the soil, without the ability to grow, the plant is rapidly reincorporated back into the ecosystem. During this process, the glyphosate is broken up into its constituent chemical building blocks, all non-toxic. Here's where the tale gets really twisted and interesting. You may know glyphosate by its proprietary name, RoundUp, and disparage it because of its corporate parent, Monsanto. Gorse and Monsanto have a lot in common. Their goal is to dominate as much territory as possible. Greedy and utterly devoid of human ethical considerations, they are willing, nay, eager, to use underhanded means to achieve their goals: Gorse employs chemical warfare (allelopathy), dispersing a toxic oil on the soil beneath it that poisons every other growing plant. Monsanto uses lawyers. Where Gorse may be held responsible for burning down small cities, Monsanto is responsible for demonizing Genetically Modified Organisms, thereby compromising a technology that could, if ethically pursued, mitigate global hunger and malnutrition. While you may join me in hating Monsanto, it's worth remembering that we, too, are invasives. Had George Bennett, the founder of Bandon, not also been the culprit who imported Irish Gorse, the city would still have its pretty pre-1936 downtown. Nobody is willing to admit their family brought Gorse to Caspar – scions of the two likeliest families point fingers at each other – but some non-native immigrant did. Every time we bring home an exotic plant, we run the risk of loosing a plague. That's how Eucalyptus, Himalaya Blackberry, Monterey Cypress, Vinca, Pampas Grass, and a long list of other invasive exotic plants got here ... and so that is certainly an important part of our story: if we are to become successfully naturalized within our environment, we have to be very, very thoughtful about who we invite to our garden parties. Humans live in symbiosis with a multitude of “passengers” that enable us to digest food and stay healthy. While many of us cringe when we think about this, one to two percent of our body mass, a mere estimated ten billion discrete organisms, are microbes that manage processes we need to live. Some of these are susceptible to glyphosate. Preliminary research has shown, for example, a probable link between glyphosate and non-Hodgkins lymphoma in agricultural workers who apply large amounts of glyphosate. There can be no doubt that ingesting glyphosate is a bad idea, and so spraying it, even on your lawn to control crabgrass, is unwise. That it is the most used agricultural herbicide, something like 200 million pounds a year, is horrifying. Despite the fact that Monsanto no longer corners the glyphosate market, it continues to spew allelopathic lies about the chemical's safety, the same way any entrenched corporation – remember the tobacco industry's denials? – fights to protect its territory, no matter how tainted. Lately, Monsanto has apparently ingested the University of California at Davis, thereby rendering any of UCD's findings suspect to those of us who mistrust Monsanto, and corporate personhood in general ... but that leads to another article by another author. So why don't we just do it already? There might be two basic reasons, but the over-riding reason is that Caspar is a community that works by consensus. We acknowledge and honor the nay-sayers, the one (or two) firm, idealistic voices that say, “Let's not support Monsanto. Let's not take any risks with herbicides.” Those with broader experience in the battle to abate exotic infestations have told us, “Without chemicals, you will never get rid of Gorse.” They told us the same thing about Eucalyptus, and, after eight years, we have nearly proved them wrong. I disagree with those idealistic voices, but I honor them in their firmness. So every fourth Saturday finds me, and a doughty crew, out on the Caspar Headlands ripping out Gorse plants ... and heather, and broom, and thistle, and the Eucalyptus stragglers. Join us. There's plenty of work to do. And afterwards, we eat lunch together.